If your order weighs less than 13 ounces, save huge on shipping with USPS first class (with tracking number). This product weighs 1.9 oz. Nature’s Sunshine Chondroitin supports structural health. Found in small amounts in foods, chondroitin is a substance produced by the body. 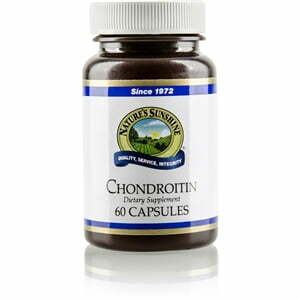 As the body ages, it produces less chondroitin, and thus the need to supplement this vital nutrient. 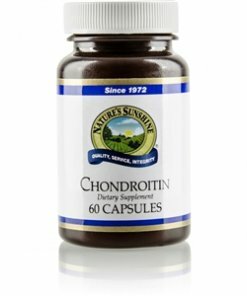 Chondroitin assists in strength maintenance by bonding connective tissue, protecting cartilage from enzymes, and assisting in moisture retention in the joints. Additionally, it supports flexibility and resiliency and cushions the structural system in high-impact activities. Along with glucosamine and other similar nutrients, chondroitin helps support cartilage health through natural rebuilding and maintenance processes. Instructions: Take two capsules with a meal twice daily. Drink one glass (8 oz) of Nature’s Spring water with the capsules. Silicon dioxide (powdered silica), magnesium stearate (vegetable), gelatin, and water.